Heading into this off-season, the Dallas Stars felt they needed an upgrade in grit, toughness and determined veteran leadership, and they improved in all three of those areas with the signing of free agent right wing Matthew Barnaby to a one-year contract on July 5. Barnaby, who played last season in Chicago, arrives in Dallas with a hard-earned reputation as a gutsy, hard-working physical forward who can spark a team with a big hit or a timely goal. And if the gloves need to be dropped in the process, so be it. "He'll bring a great deal of energy," Stars coach Dave Tippett said. "He's a good veteran guy who has a lot of respect in the dressing room and is willing to stick up for his teammates, but is also willing to push his teammates. He is a very hungry player in terms of wanting to win. I think he's going to be a great fit for our team. He's a real character guy that I think will really help us." "I've grown into being a leader," noted Barnaby, preparing for his 14th NHL season. "I'm very vocal, I say what I think and I'm not going to hide behind anything. I will bring experience and work ethic, every night coming to work. That's kind of what I've prided myself playing for 13 years, just leaving it all on the ice, bringing it all in practice and just being a great team guy." Besides his toughness and uncanny ability to get under the skin of opposing players, the 6-foot-1, 191-pound Barnaby has also demonstrated a surprisingly deft scoring touch. Last season on a struggling Blackhawks team, he registered eight goals and 28 points while averaging 13:25 of ice time per game. He has scored 12 or more goals and over 30 points five times in his career, and while those aren't overwhelming numbers, they compare favorably to other third- and fourth-line forwards around the league whose primary role is to bang bodies and create havoc on the ice like Barnaby does. "He's got better hands than a lot of people give him credit for," said new Stars center Eric Lindros, a teammate of Barnaby's with the New York Rangers from 2001-04. "He's very talented in that regard. He doesn't even give himself the credit he deserves for his skill level. He can play the game of hockey." 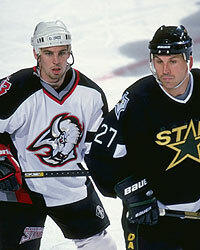 Barnaby opened a lot of eyes with his offensive abilities in the late 1990s with the Buffalo Sabres, recording career highs of 19 goals and 43 points in 1996-97, while also accumulating 249 penalty minutes. His seven goals and 13 points in 15 playoff games also helped lead Buffalo to the 1998 Eastern Conference Finals, the furthest Barnaby has ever advanced in the post-season. "I think a lot of people know him because of his grittiness and his agitating ability, but I think he's shown he can perform and he can produce," Stars winger Brenden Morrow said. "The way the league's moving, those types of players that go out and agitate have to be able to play the game. They're going to get some minutes and you want those to be good minutes." As Morrow points out, in the new NHL, with the new officiating standards enhancing speed and offensive creativity, teams need their so-called tough guys to be skilled enough to keep up and there's no question that Barnaby is. "The game is much different," he acknowledged. "I think there's always going to be a place for guys that play tough, but right now you have to be able to play the game. Gone are the days when a guy will go out and sit on the bench the whole game and not do anything, so you have to adjust your game and you have to be smart." While Barnaby possesses the skills to compete, there is no question that his knack for agitating and throwing the opposition off their game is his greatest asset. That has helped him wrack up 2,435 penalty minutes during the course of his career, second among all active players and 21st overall in NHL history. Barnaby even led the league in PIMs twice - with 335 in 1995-96 with Buffalo and in 2000-01 with Pittsburgh and Tampa Bay (265). 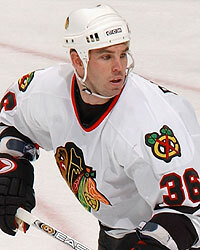 His total of 178 last year led the Blackhawks and tied for fifth in the NHL, along with Stars forward Steve Ott. In fact, along with Morrow, who was fourth with 183, Dallas now has three of the league's top six PIM leaders from last season. With the likelihood of Barnaby and Ott now playing on the Stars' fourth line together, opponents will have more than just the scoring threats of Mike Modano and Eric Lindros to worry about. 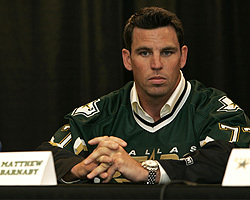 "Matt is the one, I think, flying under the radar," Stars General Manager Doug Armstrong said. "He brings an unbelievable amount of leadership and grit and character, and I think that when you look at our team, we don't want teams who get through that first and second wave to think that they can take a breather. We want to come at them with four continuous waves and I think that we're going to be able to wear teams down." Armstrong also acknowledged that part of Barnaby's role will be to influence Ott, who turns 24 on August 19, and help advance his development as an all-around player. "It's certainly going to help Steve Ott," Armstrong said of Barnaby's presence. "I know Steve Ott's excited about learning from another player, and Steve wants to take his game to a new level." Barnaby knows he is being counted on to be a good veteran teammate and help provide the leadership that good teams need to be successful. "Hopefully I'm a good teammate, I think I am," he said. "I stand up for my teammates, I think that's expected. You're expected to be disciplined, and you're expected to help the young guys, whether I'm in the lineup every night or I'm not. My goal is going to be to help guys like Steve Ott, young guys, and also to echo some of the things that (the team's other veteran leaders) say in the room and help create a winning attitude and a winning atmosphere in that room. That's why I'm here." "He's a good teammate," confirmed Lindros, who will also be looked to for leadership. "Matthew is a real character person, he means well with everything that he does. He also likes to keep things fired up and give some hits here and there. That's part of his job and part of his make-up. Matthew's a key element to any good team. Stars fans will come to love having him on their team, I can promise you that." To find him, fans just need to look for uniform number 77. After wearing number 36 last season, Barnaby had to choose a new number in Dallas, because winger Jussi Jokinen already wears that number. So Barnaby selected a new one using a detailed scientific formula designed to pick the most appropriate digits. "We rolled the dice to figure that one out," he revealed. "Everyone picked a number at home, and whichever one came up was what we'd go with. So my son (Matthew) picked 77, I picked 63, my wife (Christine) picked 33. So we rolled the dice and it came up 7, so we went with 77." But Barnaby doesn't really care what number he's wearing, as long as the team wins. Barnaby has played in the post-season just once since 2000 (in 2004 with Colorado, who, ironically, eliminated Dallas in the first round). That means four of the past five seasons, his clubs missed the playoffs. After Barnaby signed a three-year contract as a free agent with Chicago last summer, the Blackhawks finished 14th out of 15 teams in the Western Conference. But despite a solid season, the Hawks decided to buy out the rest of his deal, making him an unrestricted free agent again. To say Barnaby was happy would be an understatement. "I was very excited when I got the call on July 1st saying I got bought out and that's not a normal situation," he admitted. "I was ready, at this stage of my career, to move on and really hand pick where I wanted to be. After talking to a lot of the top teams in the league, it was my decision, my family's decision, that this was where I wanted to play." Barnaby emphasized that the most important factor in choosing his new squad was the opportunity to win. "There was only one thing," he said without hesitation. 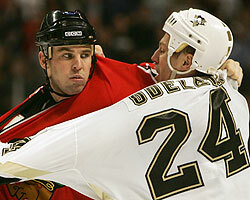 "I felt that at this stage in my career, the Stars gave me the best chance at winning a Stanley Cup. That's something I haven't achieved yet, and coming down to this point in my career, I don't want to do the rebuilding thing any more. I wanted to go to a place that's a respected organization, that's won in the past, that I think gives me the best chance to win the Cup. "My goal is to help this team win a Stanley Cup."